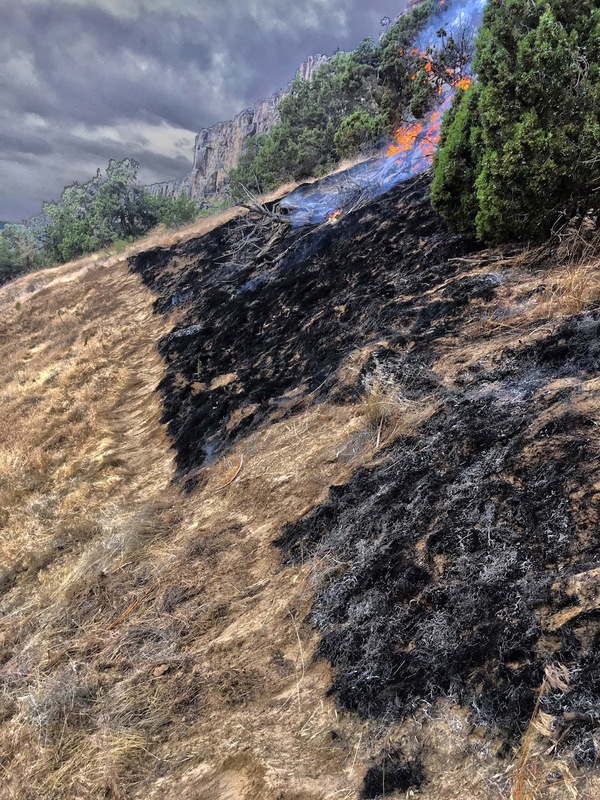 POCATELLO, Idaho – Eastern Idaho Interagency Fire Center (EIIFC) resources are responding to two wildfires, which ignited the afternoon of June 9, 2018. Recent high temperatures have easily dried lighter fuels in the area making them more susceptible to ignition. Rock Creek – The Rock Creek Fire started approximately two miles southeast of Inkom, Idaho. The fire, which was human-caused, burned 36 acres before being contained at 9:00 p.m. this evening. Firefighters expect the fire to be fully controlled by tomorrow at 12:00 p.m. Two heavy (type 4) engines and one light (type 6) engine remain on scene. Rim Fire – The Rim Fire, located six miles southwest of American Falls, Idaho, was reported to dispatch around 2:00 p.m. today. The fire is located on the north side of the river near the Massacre Rocks Campground. Burning in grass, brush and juniper, it quickly spread to 200 acres. The fire remains active on the eastern perimeter and crews are working diligently to create a solid line around the fire before the anticipated winds from the cold front arrive late this evening. Steep terrain and an abundance of lava is making firefighting efforts difficult. Four heavy engines, one dozer and one type one handcrew are on scene. Power County will assist fire operations tomorrow by jet boating firefighters into some of the more difficult areas. The cause of this fire is currently under investigation. Please remember, fireworks are illegal on public lands. Future updates, as well as information on other fires throughout the state, can be found at www.IdahoFireInfo.com.